Recall that two days ago, the Lagos state police command paraded two men, Osaro Egbomrewen and Michael Eyeoekpe, accused of killing the deceased and stealing his Kia vehicle with the intent to sell it off to an unsuspecting buyer. The suspects told newsmen that they went online to order for a taxi and the deceased came through to take them to Oke-Ira in Ogba but they made a detour to Oremeji street in Ogba where they strangled him to death and then dumped his body in front of a church. 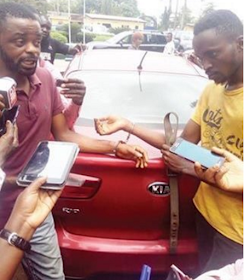 They were arrested in Benin city, Edo state where they were planning to sell his car.